Wellslock is not your grandmother’s Tupperware, or your mother’s typical plastic storage container. It’s a twenty-first-century solution to the age-old problem of keeping food fresh. Like its predecessors, Wellslock containers are made of plastic, but they also take into consideration many of today’s health and environmental concerns. Like many moms, I try to buy plastic items that are BPA free, and that are recyclable. Wellslock fits both of those requirements. And, for good measure, their products have been FDA approved eco-friendly. They even have a line of storage containers that are infused with copper alloys, which makes the plastic have antimicrobial properties. This quality makes these particular containers perfect for storing things (it doesn’t always have to be food) in places where there might be a lot of germs. Now that we’re done with all the buzzwords, let’s look at how these containers actually work. Most containers I’ve used either snap into place, or have two to four flip locks. Wellslock containers only have one latch, but it seals all four sides. It’s hard to explain without seeing it, but the lid and the sides slide into place so that when the latch is closed, it puts pressure on the sides, locking them into place. Having just one latch to lock the lid in place helps make the process of storing food (or getting it out) quicker, and actually easier. The seal is made of silicone, which is stronger than rubber. The way the pieces slide together makes the seal airtight, which prevents moisture. That way, the food (or whatever you’re storing) stays fresh for longer. It also keeps the contents from leaking, and helps the lid stay firmly attached to the container even if it’s dropped. That’s a good quality for me, because I tend to be kind of clumsy, and I can’t stand it when I drop something and the contents end up all over the floor! Anyway, Wellslock containers come in various sizes ranging from a little over one ounce to a little over five ounces, although there are larger commercial sizes available. 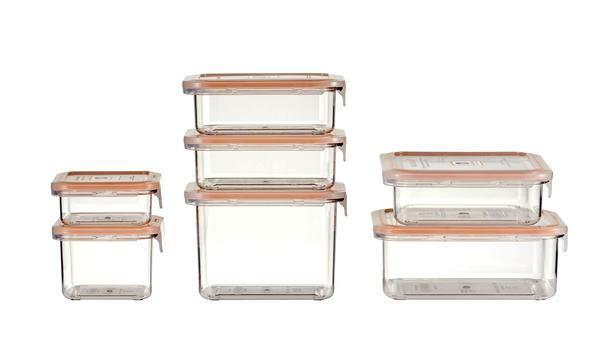 Like many other storage containers, they’re designed to be stacked and are dishwasher safe. One thing that might set them apart from other plastic containers, though, is the fact that Wellslock’s products are microwaveable. That’s just one less dirty dish I have to deal with! To learn more about Wellslock, visit their website at wellslock.com. So What If I Am Thinking About Next School Year Already….